Collector’s note: Indiana began wearing Medalist Sand-Knit uniforms at the start of the 1976-77 season. This would continue into the 1981-82 season, with Indiana wearing mesh material jerseys and shorts for the first time. For some reason, early 1980s jerseys of the mesh material do not come up for auction often. 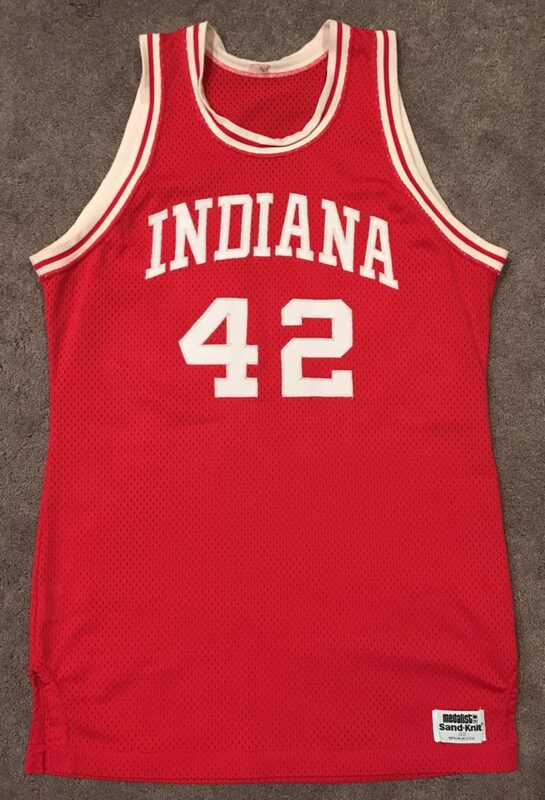 In fact, I’ve only personally seen about 3-4 varieties of Medalist Sand-Knit mesh IU game jerseys through the 1986-87 season. Following Indiana’s 1987 championship season, Champion brand uniforms would be worn by Indiana. John Flowers, who arrived in Bloomington as a promising freshman from Fort Wayne and was a solid contributor his first season, would transfer from Indiana after the 1982-83 season. At the culmination of the 1981 season, with the Indiana Hoosiers raising the NCAA Championship trophy up in celebration, fans reflected on a memorable season. Coach Bob Knight had won his second NCAA title at Indiana (the school’s fourth title overall), and his Indiana squad had produced one of the greatest season turnarounds in program history: starting off with a concerning 7-5 record overall, to winning a Big Ten Conference title, then winning their final 10 games of the season, including the NCAA final over North Carolina, 63-50 in Philadelphia. In the coming weeks and months, major changes would occur to the Indiana roster. Not only would Indiana graduate five seniors including Glen Grunwald, Phil Isenbarger, Eric Kirchner, Steve Risley, and Ray Tolbert, but star guard and All-American Isiah Thomas announced his intention to forgo his final two seasons at Indiana to declare for the NBA Draft. Tragedy would also strike the IU squad as Landon Turner, who’s excellent performance during Big Ten play and the NCAA Tournament was pivotal for Indiana’s success, had been paralyzed by a car accident over the summer prior to his senior season. Despite the numerous setbacks, optimism was present for the 1981-82 season. Returning starters Randy Wittman and Ted Kitchel would anchor a Hoosier squad with five freshman: Winston Morgan, Rick Rowray, Uwe Blab (it should be noted that Blab was the tallest player in IU basketball history), Dan Dakich, and John Flowers. Junior Jim Thomas, a key guard on the ’81 Championship team, would also be expected to take a leadership role for the young squad. 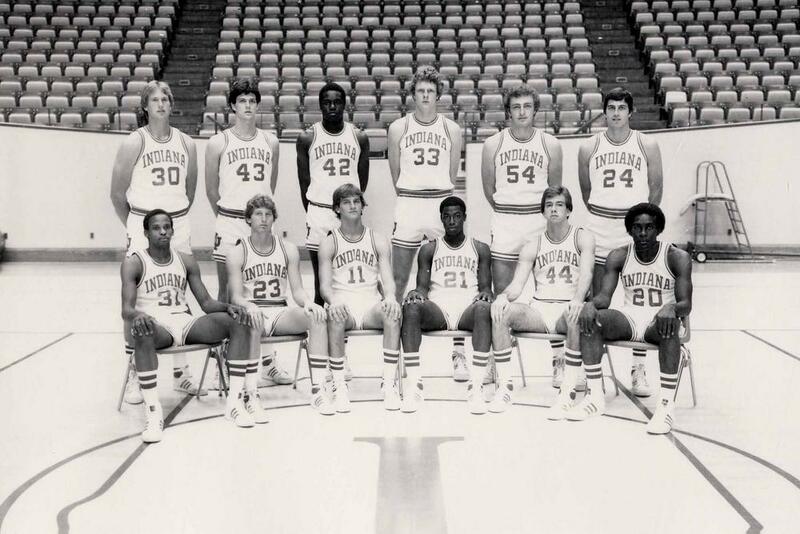 The 1981-82 Indiana Hoosiers. Photo: courtesy of Indiana University Archives. As the defending NCAA champions, the Hoosiers would be playing with a target on their backs. Not since the 1973 UCLA Bruins had a college basketball program defended their title. Indiana would begin the season with victories over Miami (OH) and Notre Dame at Assembly Hall. Kitchel would lead the way for the Hoosiers in the scoring department in both victories, scoring 24 and 22 points respectfully while Flowers added 11 in the Notre Dame victory. Indiana would enter Big Ten play on January 7, 1982 with a 6-3 record and on the road against the Michigan State Spartans. Indiana would struggle handling the ball, missing the guard play of Isaiah Thomas, and drop their conference opener 65-68. Indiana traveled to Northwestern two days later and would drop their fourth in a row, 75-61. Northwestern would snap a 20-game losing streak to Indiana with the victory. IU now stood 6-5 overall. With two home games in a row ahead against Michigan and Ohio State, the Hoosiers were able to right the ship with two straight victories. The victory over the Buckeyes would snap Ohio State’s nine-game winning streak. Kitchel continued his solid play going for 20 points, while Jim Thomas added 17. Thomas had a scare toward the end of the game after being fouled hard by OSU guard Troy Taylor. Thomas would hit the floor hard and suffer a cut to the face, while Coach Bob Knight received a technical foul responding to the incident. Free throw shooting would be key for Indiana in their victory against Illinois, 54-53, on January 21st. IU would go 16-17 from the charity stripe in the come-from-behind win. Kitchel would lead Indiana with 22 points. Two more victories in a row would come for Indiana over Purdue and Wisconsin. Indiana now stood 5-2 in conference play. Indiana’s win streak would stop, however, as the Hoosiers lost to Minnesota, 69-62. Even in the loss, Coach Bob Knight was very impressed with 7’3″ freshman center Uwe Blab, who kept Minnesota center Randy Bruer scoreless and without any rebounds in the second half. Blab would have a bright future in Bloomington. IU would drop another to Iowa on the road, 62-40, before bouncing back with a victory at Williams Arena, 58-55 over Minnesota. Blab would earn the start against the Golden Gophers and would not disappoint going for 18 points and keeping Bruer to only nine points, his lowest performance of the season. Indiana returned to Assembly Hall and defeated Illinois 73-60 behind 34 points from Kitchel. Illinois head coach Lou Henson made it clear in his post-game speech that he was glad he would only have to face Kitchel, who he called the best shooter in the conference, only one more year. A 2-2 record over their next four games left Indiana out of title contention in the Big Ten, as they now stood 9-6. Indiana still hoped for a shot at an NCAA berth, and finishing the season with three-straight victories (Michigan, Northwestern, and Minnesota) would secure it. Indiana stood 18-9 overall, and would earn an at-large bid into the NCAA Tournament where they would be the #5 seed in the Midwest Regional, facing 12th seed Robert Morris in their opener. Indiana would never be challenged by the ECAC South Champions, winning 94-62. Randy Wittman would lead the way with 16 points, while Uwe Blab, Tony Brown, and Jim Thomas each added 13 points. Despite easily winning their opening round contest, Indiana’s hopes (although slim) to defend as NCAA Champions were ended when Indiana faced Alabama-Birmingham on March 13th. A stealth defensive plan by UAB shut down shooting opportunities for Ted Kitchel and Randy Wittman and Indiana was unable to respond, falling 80-70. Guard Jim Thomas was the only Hoosier to score in double figures with 12. For a team that began the season at 6-5, earning an NCAA berth and finishing tied for second in the conference was a pleasant suprise for Hoosier fans. Ted Kitchel, who averaged 19.6 ppg, earned All-American and First Team All-Big Ten honors while Randy Wittman would earn Academic All-American and All-Big Ten honors respectfully.